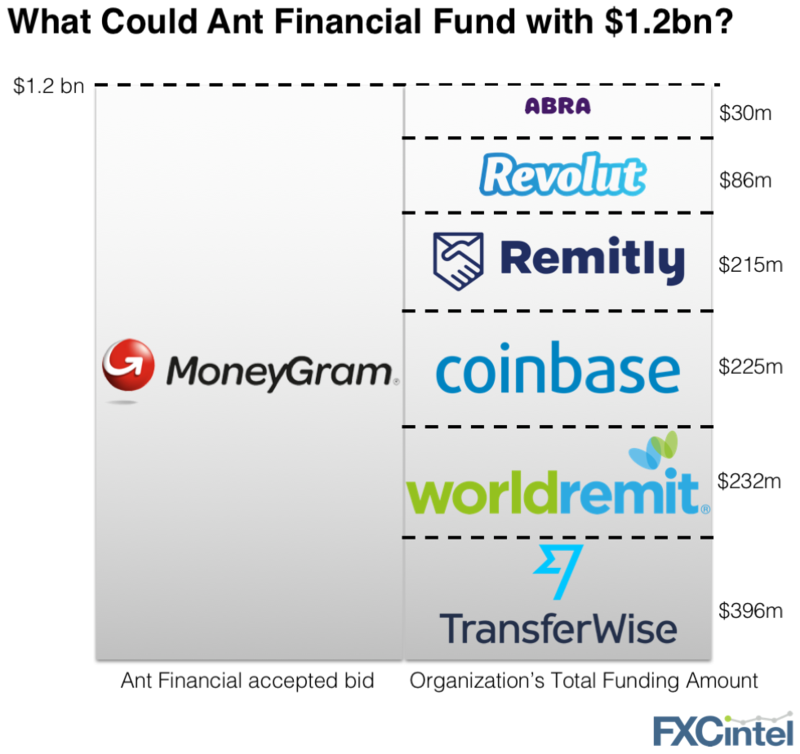 What Could Ant Financial Fund with 1.2 Billion? That $1.2bn is more than the total amount that funded a number of the most valuable consumer and wallet focused players in the space – Transferwise, Coinbase (! ), Remitly, WorldRemit, Revolut and Abra. It’s therefore safe to say that with billions available at its disposal and a desire to achieve at least one of these objectives, the money transfer market should remain on notice. While any of the companies above could not be built with such funding overnight – the giant may still enter the room, and create a lot of noise when it does. If there is one trend we can comfortably predict, blockchain and crypto-currency use by money transfer companies is going to grow (possibly exponentially) in 2018. Case in point – Ripple has just announced 3 of the top 5 global money transfer companies plan to use XRP, its own crypto-currency, for payment flows in 2018. Separately, UAE Exchange – the largest player in the Middle East – announced it is working with Blockchain network HC NET and their HC Remit product. And thats before we take into account companies such as Veem, Wyre and Abra who all already use crypto/blockchain technologies. Beware SWIFT (the global incumbent payments messaging network). However, don’t expect every company in the payment industry to jump onboard the digital currency craze. Users of several cryptocurrency payment cards – including Bitwala, Cryptopay, and Bitpay – experienced this themselves when Visa suspended their cards from its network last week without warning. And as long as these new technologies are still reliant on existing gatekeepers, such disruptions are likely to continue. We are beginning to see the implementation of some of the technology discussed in our CEO interviews last year. Jonathan Quin, CEO of World First predicted that security would become more sophisticated. Facial recognition software is now being seen on many banking apps and with the iPhone. Bill Barhydt, CEO of Abra predicted that bitcoin would become more popular- and I think we all know that was a solid prediction.